To reach the level of liberty encapsulated by the concept of being truly free is both a physical and mental endeavour that many will risk their life to obtain. Is life worth risking for the feeling of conquering fear and becoming truly free? These are the questions Jossi Wells must ask himself as he meets extreme sports performance artists, The Flying Frenchies, and takes on the challenge of his lifetime thousands of metres above the ground. 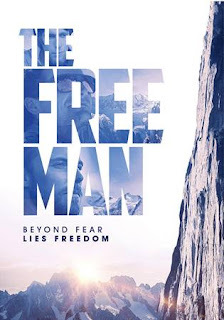 Directed by Toa Fraser (Dean Spanley, Giselle), who brings a breathtakingly cinematic sensibility and narrative construction to the world of extreme sports, THE FREE MAN is as beautiful a film as it is a thrilling one. Shot in New Zealand and France, the film offers a rare insight into the story of men who push themselves to the point of no return; men who quite literally stare into the abyss and who embrace the fact that any moment at the top of a peak or on the face of a cliff could be their last. Produced by Matthew Metcalfe (Beyond The Edge, McLaren) in his fifth collaboration with Toa Fraser, THE FREE MAN is a film that once seen, is impossible to forget. Pre-Order from Amazon by clicking the link below.